Summary: Ayusa International is currently seeking volunteer U.S. host families in New York interested in hosting a foreign exchange student for the upcoming 2015-2016 school year. 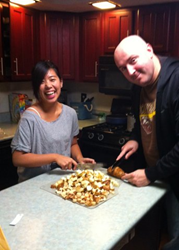 Exchange student Thuc Anh from Germany and host dad Scott Henry prepare dinner in the Henry family home in Blasdell (near Buffalo). [Thuc Anh] seems to run into friends everywhere we go, and there is a lot of hugging and squealing. Ayusa International, a non-profit organization that has promoted global learning and leadership through high school student cultural exchanges for more than 34 years, is kicking off its annual search for families in New York interested in hosting international students for the 2015-2016 school year. Ayusa host families who open their home to exchange students contribute to the global community as public diplomats for greater international understanding. Each host family and student creates a lasting relationship that spans the cultural differences between their two nations. The Henry family of Blasdell – host mom and dad Kirstie and Scott, along with nine-year-old daughter Kennedy – welcomed high school student Thuc Anh into their home for the 2014-2015 academic year. Although she grew up in Germany, Thuc Anh’s family is from Viet Nam. Early on she was worried she was not contributing enough to the household, so Scott designated her in charge of keeping the kitchen tidy. “Scott calls her his sous-chef, because she is always in the kitchen helping when we are cooking,” says Kirstie.